Canon's flagship APS-C camera finally delivers on the video DSLR promise—with a catch. This review was published on November 12, 2013. Since then, this product may have been discontinued or replaced. Pricing and availability may differ from what is stated in the review. The Canon EOS 70D is the latest in a rather long line of high-performance APS-C DSLRs from the camera giant. With new Dual Pixel AF technology offering drastically improved autofocus, the 70D has plenty for the technically-minded among us to dig into. The camera blazed through our lab tests with few issues, improving on the 60D in almost every way. Unfortunately, the areas where the 70D hasn't improved much—dynamic range and high ISO performance—are the same areas where most of the competition has improved by leaps and bounds. That said, we still feel that the 70D is the most complete all-around system camera in this part of the market. People who exclusively shoot stills will likely find competing options from Nikon and Pentax to be a better fit, but if video is part of your workflow then the 70D's new AF system is hard to beat. The Canon EOS 70D managed one of the best color accuracy scores that we have recorded to date. 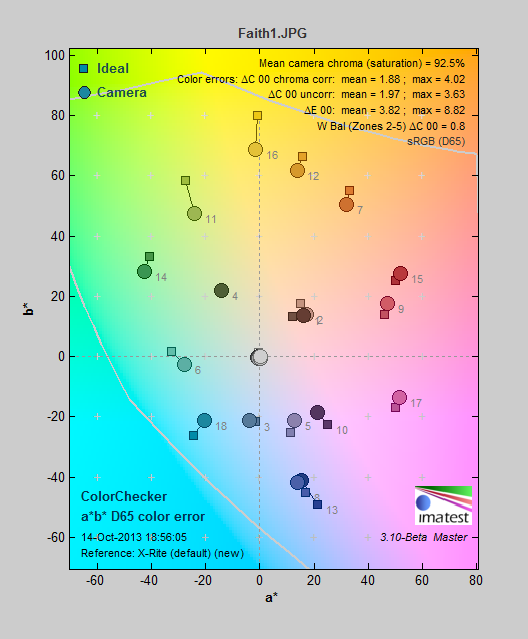 In our standard color test the 70D's best mode (Faithful) had an average error (∆C00 saturation corrected) of just 1.88. Anything below 2.3 is excellent, and a ∆C00 of below 2 is truly superb. The only issue with the Faithful mode is that it is slightly undersaturated at around 92.5% of the ideal. In this performance graph from Imatest, the 70D's extreme color accuracy can be seen with near-perfect results across the board. In the other color modes the 70D was also typically excellent, with some minor differences. The Auto, Neutral, Portrait, and Standard modes were all roughly the same, with a ∆C00 of around 2.5. Auto and Standard had near perfect 100% saturation, with Neutral falling to 93% and Portrait pushing things to around 105%. With all of these modes you can expect accurate colors, though they tend to emphasize certain colors over others depending on the scene. 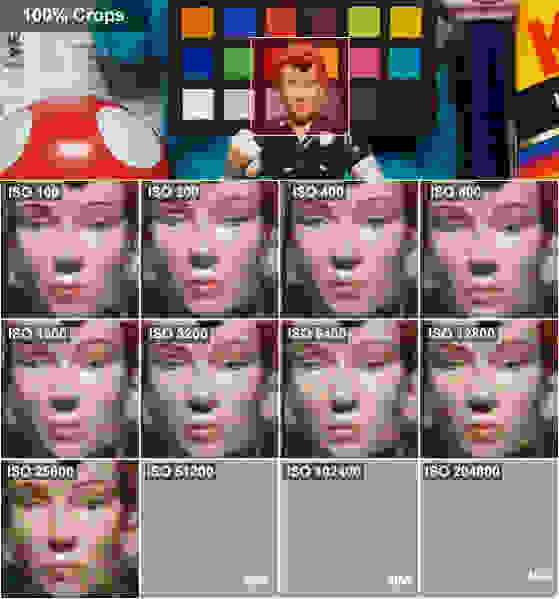 The only mode on the 70D that had a large error was Landscape, with a ∆C00 of 3.98 and saturation around 115% of the ideal. This mode is for verdant vistas and it tends to push blues and greens to look more vibrant than what they are in real life. This often makes landscapes look much better than in other modes, but just be sure to switch out of it if you want to take a portrait or some other kind of shot. 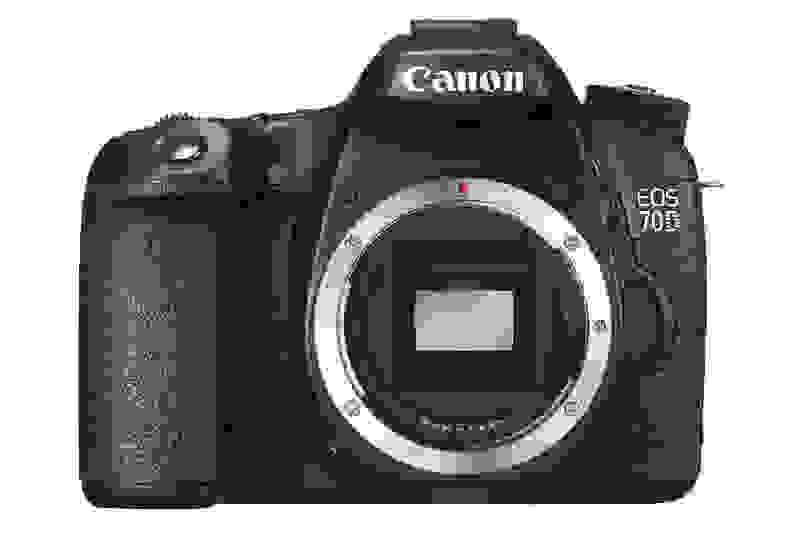 The Canon EOS 70D offers an ISO range that stretches from 100-25600, in both RAW and JPEG. If shooting JPEGs, you also have the option of applying noise reduction, which will use some math trickery to smooth out as much noise as possible. Noise reduction comes in three flavors: Low, Medium, and High, as well as the option to turn it off entirely. With noise reduction off, the 70D returned around 0.72% noise at ISO 100. This is barely perceptible in most scenes, and most cameras do well here. If you have to ramp up the ISO to shoot in lower light, you can expect noise to rise quickly. Typically we don't recommend shooting at any ISO setting where noise rises above 2%, which happens at all settings above ISO 1600 with no noise reduction applied. The Canon 70D clearly hits a wall between ISO 1600 and 3200 where chroma noise begins to overpower the image. The 70D keeps noise below this 2% threshold through ISO 3200 with noise reduction set to Low, through ISO 12800 with noise reduction set to Medium, and essentially through the entire range with noise reduction set to High. While this sounds great, the tradeoff is that as you apply higher levels of noise reduction, you begin to lose fine detail in your final shot. As you can see in the crops above, image quality really starts to take a hit around ISO 3200, falling off quickly from there. Canon's Dual Pixel CMOS AF technology is a ground-up rethinking of the way a camera focuses during video, but it potentially presents some new obstacles. By essentially splitting every pixel into two separate photodiodes, Canon's design does run the risk of limiting dynamic range; any extra circuitry required to manage the incoming information could reduce the area dedicated to capturing light, causing a hit to image quality. Luckily, Canon seems to have already worked around these issues, as the 70D has better dynamic range than we saw with the 60D and is roughly on par with the rest of its DSLR lineup. At base ISO we were able to capture around 7.13 stops of "High" dynamic range, which we define as whole stops where the camera preserves a signal to noise ratio of greater than 10. This puts the 70D in some fine company and is about on par with most current mid-range DSLRs and mirrorless cameras. We recorded 6.87 stops of range at ISO 200, 5.36 stops at ISO 400, but unfortunately performance falls off soon thereafter. We saw just 3.22 stops at ISO 1600 and 2.28 stops at ISO 3200. From ISO 6400 and above the 70D didn't record a single stops of range that met this 10:1 SNR criteria. This matches up with our anecdotal ISO crops above, where image quality really takes a dive after ISO 3200. It's not terrible performance by any means, but it's only about on par with what we saw recently with the Panasonic GM1, which retails for just $749.99 body-only. Is this the fault of Dual Pixel AF? It doesn't appear to be so. As far as we know, Canon fabricates all of its own DSLR sensors and this performance is right in line with what we've seen from other APS-C Canon DSLRs over the last few years. It does lag slightly behind what we've seen with Nikon and Pentax—both of which utilize third-party sensors from Sony, Aptina, or Toshiba—but the 70D is at least on par with other recent Canon cameras. It's possible that this is a new generation of sensor that would perform better were it not for the Dual Pixel construction, but we'd still call that a worthy tradeoff given the otherwise solid performance displayed here. The 70D produces some of the best video we've seen from a still camera this year, lagging behind only a few other cameras we've recently tested. Paired with the 18-55mm STM kit lens, the 70D also displayed adequate sharpness, excellent low light sensitivity, and smooth autofocus thanks to the built-in stepping motor. In our bright light sharpness test we recorded roughly 600 line pairs per picture height (LPPH) of sharpness horizontally and 700 LPPH vertically. In low light (60 lux) that fell to 575 LPPH horizontally, though the ALL-I compression type preserved 700 LPPH vertically despite the increased gain. In our low light sensitivity test the 70D shined. In our low light sensitivity test the 70D shined, requiring just 2 lux of light to produce an acceptably bright image. We consider "acceptably bright" to be anything that hits at least 50 IRE on a waveform monitor, which is a standard measure of brightness. The 70D could probably go even higher if you manually set the ISO speed to its maximum setting in video. With our video motion rig the 70D's excellent 1080/30p footage held up very well. There was very little trailing visible in our test video, and practically no artifacting. There was slight frequency interference, but overall the 70D performs excellently despite some rolling shutter that is par for the course with DSLRs. The quality difference between ALL-I compression and IPB compression is minimal overall, though the ALL-I footage is considerably easier to edit while the IPB video takes up less space. The 70D managed a very respectable seven frames per second shooting in our continuous shooting test, in both RAW and JPEG. Capacity is a real limitation with the camera, though, as it could only manage around ten shots when shooting RAW and just five frames at that speed when shooting RAW+JPEG. JPEG alone was much better, with the camera capable of around 50 shots at full speed before slowing down. These speeds are of course with autofocus and exposure locked on the first frame. You can shoot continuously with continuous autofocus enabled, but as the camera is tracking the subject, your speed will depend on the system's ability to keep a subject in focus. We found that subject tracking AF worked fairly well, tracking subjects around the frame with relative ease.